We'll go inside the kitchen João's family-run bakery in downtown Lisbon, that won 3rd Best Pastel de Nata in Lisbon in 2018. This is where you will learn how to bake the irresistible Portuguese Custard Tarts - aka Pastel de Nata! This class is open to all levels, even if you don't have previous baking experience. If you like sweet treats, we like you! We'll make puff pastry like the pros do, cook the custard from scratch and bake it all inside a professional oven. Meanwhile, João will entertain us with stories about his life as a baker. In the end, we'll eat the warm tarts along with coffee or, even better, some sour cherry liqueur served inside an edible chocolate cup, while hanging out with the other participants. This class runs every day for 2 hours, between 2 PM and 4 PM, in small groups of up to 10 people. real award-winning Portuguese bakery: Pastelaria Batalha! Our Pastel de Nata Master! João was literally born into the food business! He is a 5th generation baker. When he was a baby, his crib used to be placed on top of the ice cream counter of his Family's restaurant. By age 7 João was making coffee, standing on a chair to reach the espresso machine. By 12 he was mixing a killer sangria and his Dad would always get a little angry when he'd try to sip it before serving it. By 14 he started learning how to bake pastries and bread. That's when he decided he'd study hospitality management. 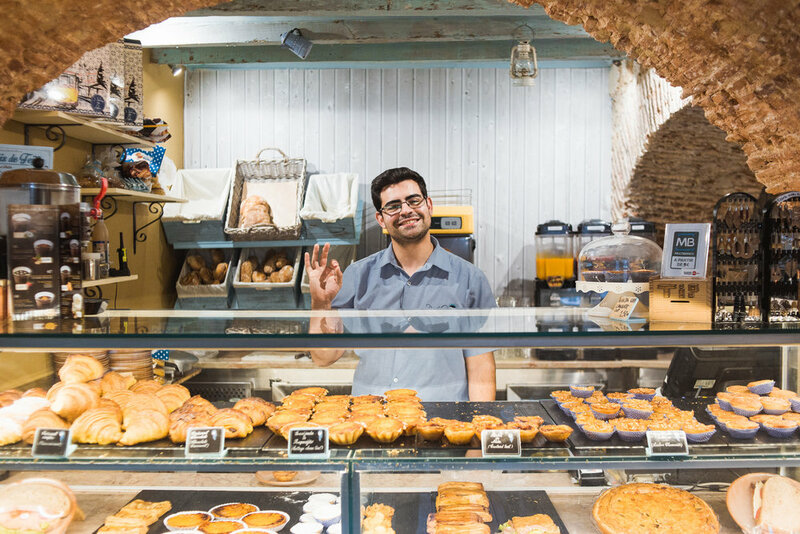 He completed his studies in Spain, worked in London and he is now the owner of Pastelaria Batalha in the heart of Lisbon, where he also runs Pastel de Nata Workshops. But we also speak several languages! Default group classes (up to 10 people) are in English. Classes can happen in English, Spanish, French or Portuguese. We welcome adults, kids, birthdays, bachelor & bachelorette parties, and team building groups with specific requirements. for classes during week days, please make your booking via airbnb experiences! See what folks are saying on Tripadvisor and Airbnb! To learn more about Portuguese food, check out Lisbon in 100 Bites - The Ultimate Lisbon Food Guide!